View of “Fun Sponge,” 2013. Institute of Contemporary Art at Maine College of Art. 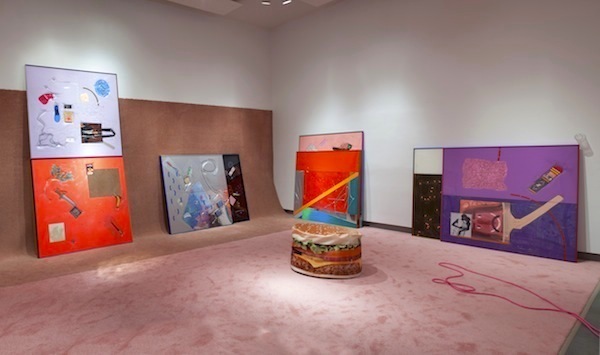 Alex Da Corte is a Philadelphia-based artist, collector, and scavenger. His work in video, installation, and painting is invested in troubling and disseminating the notion of authorship while simultaneously tracing networks and communities. He speaks here about his solo exhibition “Fun Sponge,” on view at the Institute of Contemporary Art at Maine College of Art until August 4, 2013. Da Corte’s work is also featured in a two-person solo show with Borna Sammak at Oko Gallery in New York until September 12, 2013, and in a solo show at Joe Sheftel Gallery in New York from September 8 to October, 13, 2013. “FUN SPONGE” IS LIKE A BEDROOM FLOOR, offering a palimpsest of experiences. What is there belongs to many people. I have included the work of John Roebas, Sean Fitzgerald, Andrew Gbur, Sascha Braunig, Nancy Lupo, Alex Ebstein, Seth Adelsberger, Brian Kokoska, Mitchell Kehe, Brendan Smith, and Gaby Wolodarski by embedding them in my paintings. Participants of the exhibition are invited to touch, sort, and rearrange these works and other props that are situated within a carpeted room in the gallery. The work then becomes alive in the hands of others, an open-source engagement. There is something strange about objects moving in a space—the way a balloon might move around an empty room—when you’re not there. It makes my hair stand up on my neck, but that’s a good thing. The show is about the shuffling of space, the way someone might shuffle through CDs, records, or books. There are twenty-four Plastics Paintings referencing the twenty-four frames per second of animation. They are made by trapping assorted materials like cheese, shampoo, foil, and the other artists’ paintings behind adhesive sign vinyl and pressing them against the backside of the Plexiglas like a reverse glass painting. I studied animation at the School of Visual Arts, and I always go back to flattening space this way, or trying to access space in terms of time. We walk forward or backward in time, depending on who we are and when we’ve last been in the same place. I’m interested in the edges of these images and frames. It’s as if I tell you an anecdote, and then you tell me you told the same story to me already, that it’s your story and I forgot that it’s not mine. Therein lies the reverse side of an experience. I think about how the objects I collect can be shared, or how they can cross race and gender but still reflect the flavor of a community by the way they are utilized. I think about what residue is left from person to person when they touch the same object. That’s where this aspect about networks comes up in my work. I absorb other people’s work in mine, embedding theirs in a larger framed image in order to undo what they might have had in their original frame. Many of the artists I work with are painters. Painters can’t touch their own paintings once the work is behind glass. It’s like when one puts a Band-Aid on their hand; they can’t see the other side of the Band-Aid against their skin. But it might be neat if they did. I want to pull out the desire to touch in these artists’ work. Not just look at the glove—wear the glove. Working with all these artists, I think of myself as a director. If a movie is a success, the actors will take the credit, but if it’s a failure, the actors can walk away as the director takes the fall. My projects hinge on the work of other people, but I’m creating a platform for them to engage in ways that they might not have been able to otherwise. I’m always trying to track and confuse where things come from.